Here is the 3rd and final entry of A Road Less Traveled, my blog series detailing my summer roadtrip along California's scenic remote HWY 33. If you have not already, now would be a great time to read the first and second posts! 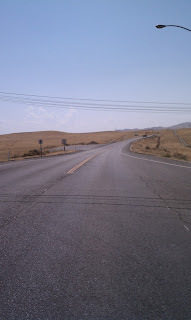 I exited Interstate 5 and headed south on California Highway 33. This area is quite desolate and has a lonely feel, and the sun was beaming down furiously. 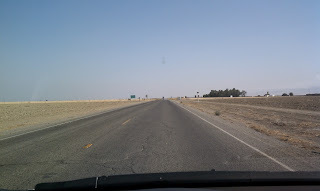 The highway meanders south/southwest for about ten miles before arriving at the town of with Coalinga, CA. Like many of the towns out here, Coalinga was once populated with workers servicing the area's plentiful oil fields. Unfortunately, drilling production declines and increasing mechanization mean fewer jobs, and thus fewer residents. 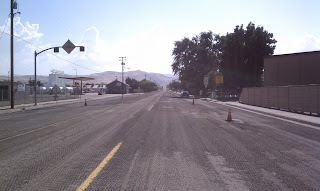 HWY 33 through Coalinga - repaving in progress! 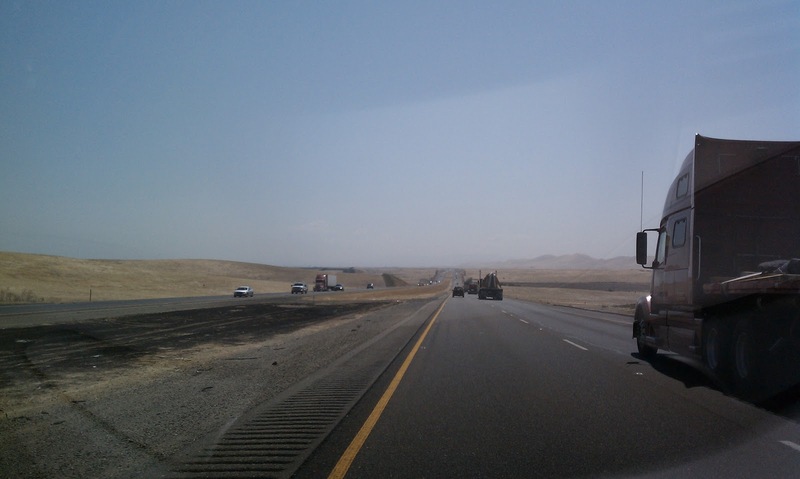 After leaving Coalinga, the 33 parallels Interstate 5 along the western edge of the Central Valley. 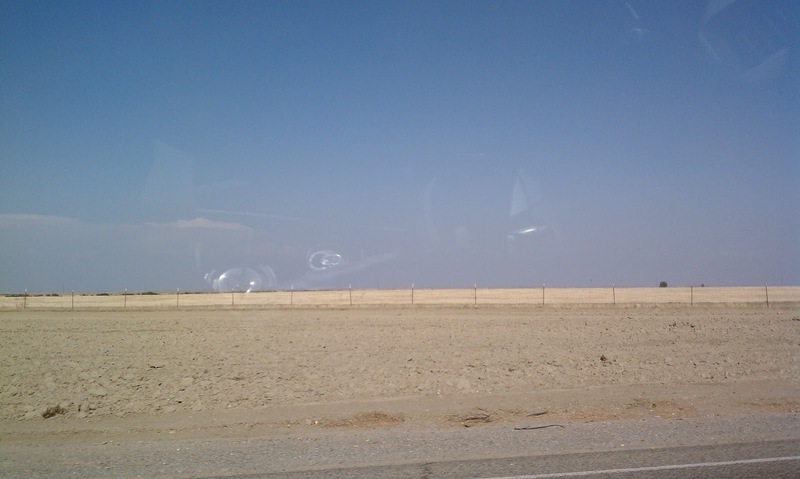 The rolling hills flatten out, and the terrain becomes desolate. Not much exists aside from the thin ribbon of pavement. And the view to the side of the road. Hey look! A fence! Taft remains one of the largest towns on the old Hwy 33, although it clearly appears to be far past it's prime. The Highway ran along the edge of the downtown, and revealed mostly closed storefronts and dark windows. 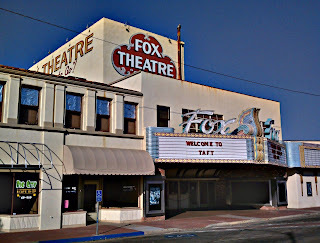 The old movie theater was barren and forgotten with a unenthusiastic greeting scrawled on its marque. After Taft, Hwy 33 intersects with Hwy 166 in Maricopa, CA. Maricopa is a shell of a town which makes Taft look it a thriving metropolis. South towards Pine Mountain. Ojai and Ventura are directly over the mountain. Pine Mountain Sattle, Hwy 33, with ridge access roads. After climbing up the New Cayuma valley and cresting the Traverse Range, Hwy 33 pops out and winds down into the coastal valleys of Ojai, CA. At the summit at Pine Mountain, two small roads (on on either side) provide access to exciting trails and outlooks along the ridge! Back to 101 and my destination of Santa Barbara! California has unmatched physical beauty. Drastic coastlines and mountains contrast with rolling hills and fertile valleys to produce a land rich with the possibility of adventure. 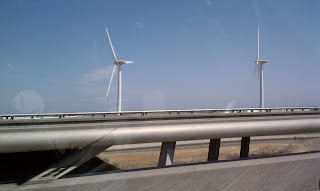 In my previous post I began to review the scenic drive from the Bay Area to Santa Barbara. 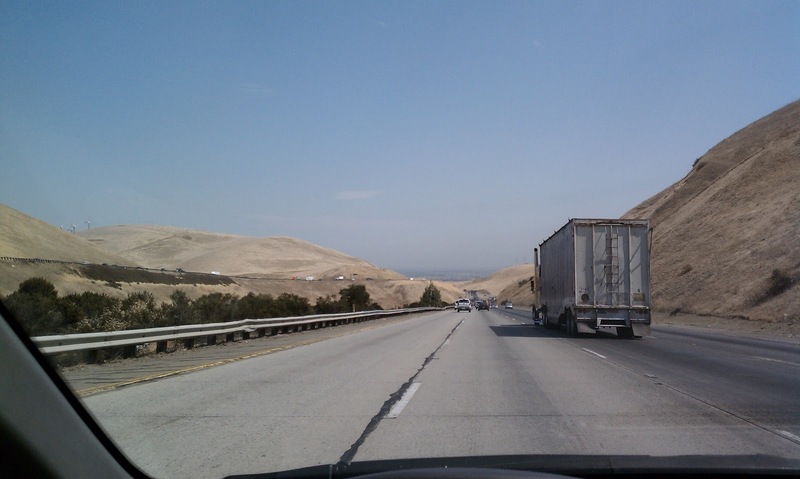 In today's post, I will take you down Interstate 5 the junction with Highway 33. Let's pick up where we left off last time, at I-580 as it snakes up and over the Altamont Pass near Livermore, CA. Once 'the 580' hits the floor of the Central Valley,it merges with the westbound I-205 from Tracy, and then turns south/south-east to follow the hills along the western side of the Central Valley. There is not much to see out here besides a huge Safeway packing plant, and high voltage power lines carrying electricity to the distant coastal metropolises. 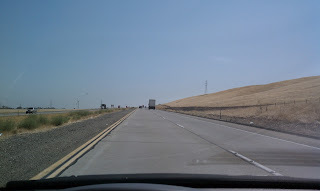 Interstate 5 is straight as an arrow and as excited as remedial arithmetic. 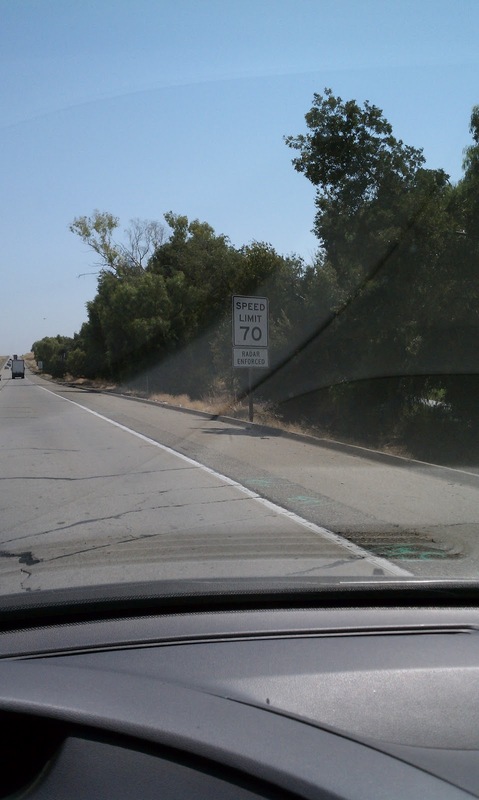 The name of the game is speed; traffic flows around 70-80 mp/h, with even tractor-trailers going close to 70 mp/h! I got off the Interstate at the Hwy 33 turnoff and pulled over to take in the scenery. When I opened my door, an unholy stench assaulted my nostrils. It turns out that Hwy 33 intersects I-5 near Harris Farms Cattle Feed Lot. This feed lots is comprised of acres of cows standing in their own filth. Stream is often visible above the lot as it bakes in the hot California sun, and the smell itself is a land mark well known by travelers on this section of interstate. ... The Horrific Smell only allowed me to stay for a few minutes. I pity these cows who are trapped here, and feel momentarily ashamed of my membership in the Human Race. 'Good Luck, Cows,' I think to myself as I get back into my car, the virtues of vegetarianism dancing through my mind. 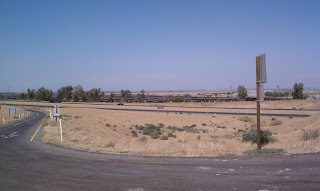 View of feed lot from across the Interstate. All stinky feed lots aside, I now was face to face with Hwy 33: 100 miles of curvy blacktop stretching into the most remote reaches of Santa Barbara, Kern, Fresno, and San Luis Obispo counties. Looking West down Hwy 33. Interstate 5 is directly behind me. We have reached as far as the interstate will take up on this journey. Join me next time for a taste of Central California's break-taking highland landscape. Every day we wake up, retrieve our smart phone from it's charger and start the day. We wander around, using the internet everywhere we go. We record videos and post them to youtube. We make skype video calls from moving trains and subways. And rarely is one thought is given to appreciating the incredible wireless backbone which makes our mobile revolution possible. Do you know what a cell tower looks like? Do you have any idea how many you pass on your way to work or school? You will be shocked to see how many cell towers exists EVERYWHERE to provide phone and data service to our mobile devices. These towers are everywherer, but the Cell Phone Carriers are notoriously tight-lipped about the location and number of their towers. The registered owners of cell sites are often shell companies which make it difficult to determine which carrier(s) use a given tower. It is possible to roughly estimate a tower's location by comparing your device's reception levels to an ambiguous government registry of transmitter owners. Each cell carrier maintains a 'base station almanic' which details the location and characteristics of each transmitter, but these almanacs are usually not public. Some 3rd party companies have created public base station almanacs, but these must be paid for. Introducing the Open Cell ID Project. The goal of Open Cell ID is to produce a comprehensive, crowded-sourced directory detailing where cell towers are located, and which carriers transmit from a given tower. Previously, this information was available to only cell carriers themselves. Some deep-pocketed 3rd parties such as Google and Skyhook drive vehicles around the country and map out cell tower locations based on signal strength. This is a laborious process, and data produced in these efforts is often not shared publicly. Open Cell ID, on the other hand, seeks to use crowd-sourced effort, information, and research to locate every cell tower on the planet. These locations will then be made available in API so that developers can have full access to information on tower locations which the carriers do not want us to have! View a cell tower overlay in Google Earth! And click here to view Open Cell ID's most recently added towers. How many cell towers are near your house? Where is the closest? Every wondered why your call would drop at the same place on your commute every day? Now you can see where the antennae towers are that make our phones work at the Open Cell ID Project. As summer draws to a close, it is time to pack the bags, load up the compact sedans, and head back to college! I always like to start off the year with an adventure, so I pulled out my map and picked a nice, long, curvy route from the San Francisco Bay Area back to Santa Barbara. I decided to take California Hwy 33 for as long as possible during my drive. 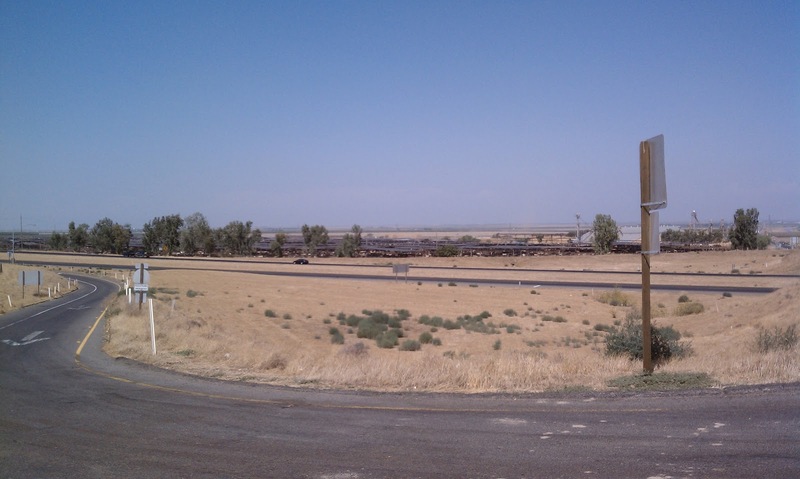 Hwy 33 runs north-south down California's Central Valley parallel to I-5, and provides a scenic look at a number of small oil towns, and the Petroleum fields which surround them. To get to Hwy 33 however, I'd have to take Interstate 580 out of the bay area to catch Interstate 5 in California's Central valley. From the 5, as it's locally known, I would be able to catch Hwy 33 South through valleys and mountains, eventually ending up at the Central Coast! Over the next couple days, I will be profiling each highway segment I covered on this trip. I started my trip from a friend's house in Berkeley right near the Interstate! 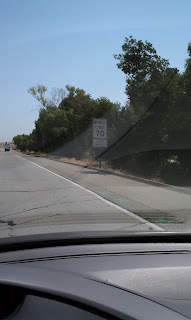 I got on I-580 East and followed it through the Oakland Hills and Castro Valley out of the Bay Area! 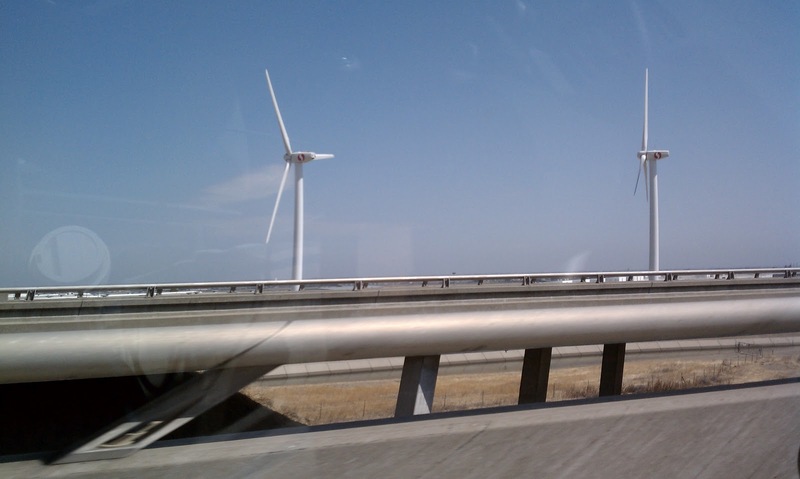 After the Altamont Pass, it gets flat and straight for hundreds of miles. The surrounding land is mostly agricultural, with some industrial areas. Few notable landmarks are present aside for the occasional truck stop. 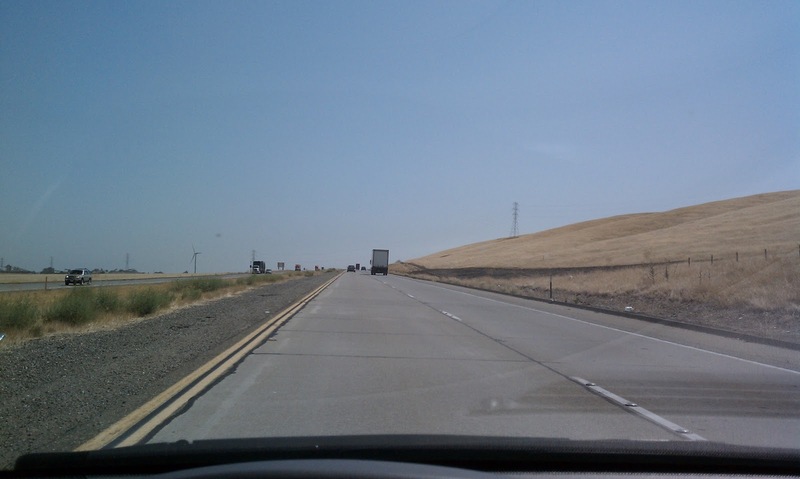 I-580, 205, and 5 for a triangle in the central valley. Interstate 5 is California's major North-South artery connecting Sacramento and the Bay Area to Southern California. Most people driving this route are on a long distance trip! 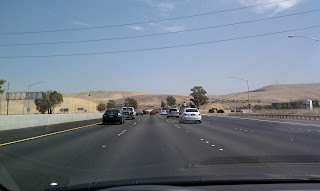 I-580 near I-5. It will look like this for a while now! 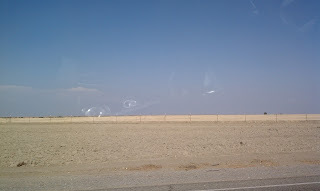 Now I am in California's Central Valley making my way south! The next post will take us down I-5 to Hwy 33. Cheers!